A failed sewer line understandably strikes fear in the hearts of homeowners. For one, the high cost of sewer line replacement can make a major impact on most homeowners' bank accounts. For another, a completely failed sewer line means that all waste-water operations in the house must cease: toilets, sinks, showers, and bathtubs. 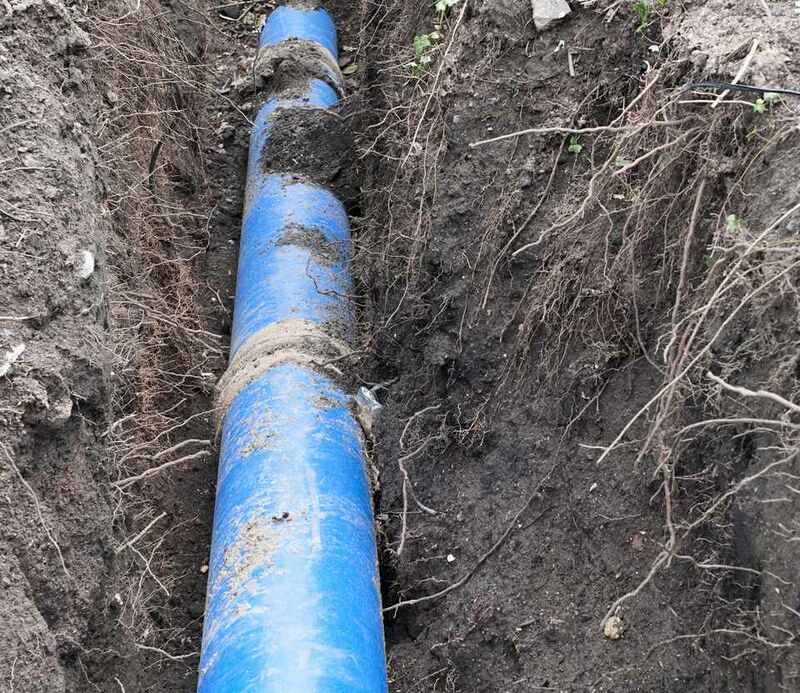 When a contractor produces an estimate on costs to fix your sewer line, the estimate includes both the cost of digging the trench with earth-moving equipment and the cost of the actual pipe replacement. If you are up to the task of hand-digging the trench required to access the old sewer line and install the new line, you can cut costs dramatically. If you go the next step and replace the line by yourself, the cost of replacing the sewer line comes to cents on the dollar as compared to full-service replacement by a contractor. Digging and then working in a deep trench can be dangerous. According to the Occupational Safety and Health Administration (OSHA), an average of 70 workers die annually when the earthen walls of trenches collapse on them while they are working within the trenches. An open trench also poses a distinct hazard to children and pets. Make sure to take precautions if your trench needs to be a deep one. Trench shields prevent the walls of the trench from collapse, and OSHA regulations require the use of trench shields for trenches 5 feet or deeper. As a homeowner, you are not bound by OSHA regulations, but it is wise to follow OSHA guidelines for your own safety. Digging a trench down to your sewer line is mostly just a matter of hard work. It is not technically difficult, but it can be extremely demanding physically. One adult in reasonably good shape may expect to dig a sewer trench 4 feet deep by 8 feet long by 3 feet wide in one weekend of long work days. This estimate is based on the assumption that you have loose soil with a moderate number of roots to cut through. Clay or densely packed soil, as well as the presence of many large roots, can increase digging time significantly. Cold climates, too, present other complications. First, in these areas, the depth of the sewer pipe can be quite deep because the frost line may be 4 feet or more below the surface. Second, if your sewer line fails in winter, you are faced with the difficult task of breaking through frozen ground in freezing temperatures. This may be impossible to do by hand, and you may need to call in the earth-moving equipment. One of the most critical steps in digging a trench for sewer line replacement is making sure you are digging in the right location. If you have no idea where your sewer line runs, a video camera inspection can tell you. The technician will run the camera from the sewer clean-out and down the sewer line from your house and can stop at various points. The camera has a radio transmitter that signals its location. At any point, the technician can sweep a locator over the ground so that it reads the signal. Be as accurate as possible because you will pay a high price in useless labor for hand-digging at the wrong spot. Work with the technician until you are certain that you have found the accurate location, then mark it with a line of marking paint. Call your local utility locator number. This is usually a free service to residents, funded and managed by utility companies. Technicians will mark your yard for electrical, water, gas, and other vital services. Do not forget that there may be other homeowner-installed services such as sprinkler lines and landscape lights in your yard, outside of the purview of utility companies. It is highly likely that your community requires a permit as a safety measure to ensure that the work is done correctly. An inspector will visit the work site to make sure the work has been done in compliance with the code. In the case of a sewer line replacement, this is normally done after the new sewer line has been installed, but before the trench has been filled. Before you can get to the soil, you may have to remove obstructions such as concrete or brick sidewalks, driveways, or slabs. Use an 8-pound sledgehammer to break up concrete, starting on the edge. Electric or pneumatic jackhammers can also be leased at tool rental centers. Dig straight down, minimizing side digging as much as possible for the time being. Later, you will need to extend the trench sideways so that you can stand in the pit and create access to the sewer line. But do as little side digging as possible until you have located the sewer line. As you dig, you may need to clip or saw off tree and bush roots as you encounter them. Some small roots can be severed with your shovel blade. Other roots should be clipped with pruning shears or a hand saw. Heavier roots will require a chainsaw. The depth at which you reach the sewer line will vary. It can be as shallow as 18 to 30 inches or as much as 5 or 6 feet. In cold climates, the pipe will be buried deeper to prevent the pipe from freezing in the winter. But pipe depth is not always a matter of climate. Even in warm climates, the pipe can sometimes be buried very deep—it may depend on how deep your community's sewer mains are located. If your sewer problem is an emergency, you may smell the pipe before you see it. You might find that the soil is saturated with waste-water. If the sewer line has been well laid, the appearance of a gravel layer will alert you that you are close to the sewer line. At this point, dig rather carefully as you excavate space around the sewer line, which may be a plastic pipe, clay pipe, or cast-iron pipe. You might even find several types of pipe spliced together. Clear away a good amount of soil all around the pipe to allow the contractor easy access to replace the pipe. Until the sewer replacement is complete, it is very important to guard the trench against pets or children who might fall in. This can be done by covering the trench or by erecting sturdy temporary fencing to guard against intrusion. After the sewer replacement is complete, make sure to have the work inspected before filling in the trench with soil. As you fill in the trench, periodically compress the soil to prevent later settling of the earth. What Are the Steps to Repairing Vinyl Siding? Is Removing Asbestos Shingles on Wood House Legal? How Do You Prevent and Remove Ice Dams?